Tremor Media, a New York-based online video monetization and advertising company, recently acquired streaming ad placement service provider ScanScout for an undisclosed sum. Now, thanks to this SEC filing, we know they spent at least $65 million on the merger. If the transaction was all stock, that’s the purchase price. If the agreement also included partial payment in cash, that means the purchase price was actually higher that that. Either way, it’s quite a big bet on Tremor Media’s part – the company’s raised just south of $80 million to date (half of which was secured in April of this year). According to the filing, nearly $1.9 million of the proceeds was paid to one or more executives or directors of the merged entity. Update: a spokesperson tells us the filing was actually slightly incorrect. According to him, none of the cash proceeds were actually kept by the directors or executive, but completely reinvested in the company. He also noted that the merger was “by far mostly in stock”. 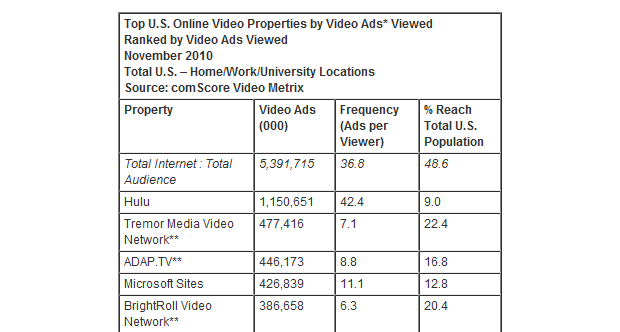 Digital measurement company comScore recently released online video numbers for November, 2010. The company found that Americans viewed more than 5.4 billion online video ads that month alone. Hulu took the top spot, serving more than 1.1 billion ads. Second to Hulu was Tremor Media, ahead of Microsoft Sites, Brightroll and AOL.com but a far cry from the leading ad network – the company served 477 million online video ads, and its viewers averaged 7.1 ads per person. The top video ad network in terms of potential reach of the total U.S. population was … ScanScout, at 44.3 percent.